Phew, summer in York is so busy and exciting and full of controversy that it’s quite exhausting at times and I had to go away for a while and recover. Meanwhile the city managed to fight off the invasion by giant inflatable phalluses carried by visiting hordes — apparently all it needed was the police requesting deflation of the inappropriate inflatables/offending articles, but news had already reached the national press that York was having problems with ‘gigantic willies’. 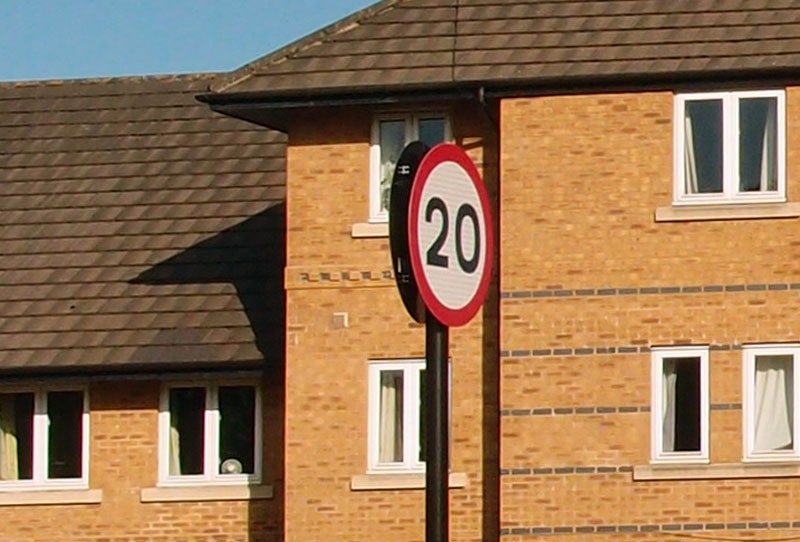 Attention now turns to whether to rid the city of another recent invasion: 20 mph signs. Here’s one example, at the entrance to Skelton Court, off the street of Clifton, near Clifton Green. Skelton Court isn’t just a cul-de-sac, it’s a very short cul-de-sac — its end wall is visible from the archway at its entrance. Here’s an idea of the length of it, on Google Street View. 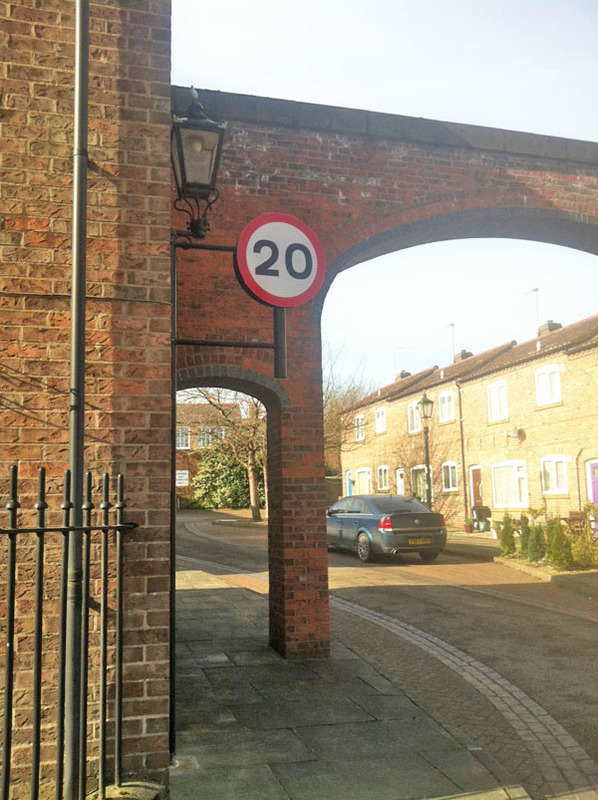 I’m not a driver, so don’t claim to be an expert, but I doubt very much that anyone has ever attempted to enter Skelton Court at more than 20 mph, or that it’s likely that anyone ever would, sign or no sign. Which means the sign is a complete waste of money. And there are apparently many other essentially pointless examples cluttering up the place. Obviously they’re not doing any actual harm, but they are rather irritating to many residents, including me, for a couple of reasons. Partly because of the cost of them – around £500,000-£600,000. This money apparently didn’t come from our council tax — which would have made me really quite furious — but from some special budget from central government. But it’s still a lot of money, in an age of many cutbacks in funding for more important things. The other argument against them is that all this signage is just more ‘street clutter’. The introduction of these signs seems to have been a project instigated and enthusiastically supported by former Labour councillor Anna Semlyen, so much so that perhaps we could call them Semlyen Signs. And they might soon be gone, suggests the current administration’s executive member for transport, Cllr Ian Gillies, as reported in the press and radio coverage today. I’m finding it difficult to understand what benefit there might be in taking them away, now they’re there. Won’t that just cost more? Paying people to go round the suburbs dismantling them? And then what? Stick them all in a shed somewhere? Sell them for scrap? It looks more like some kind of symbolic gesture, like Cllr Gillies and colleagues want to remove the Semlyen Signs as some kind of visible indicator of how this current administration intends to reclaim the city from all that Lefty stuff from before. Maybe when Conservative-voting drivers pass these signs they see them like some kind of offensive Lefty/Labour flag, stuck there to claim control of the territory and boss us all about. “The biggest problem in health is people not doing enough physical exercise. 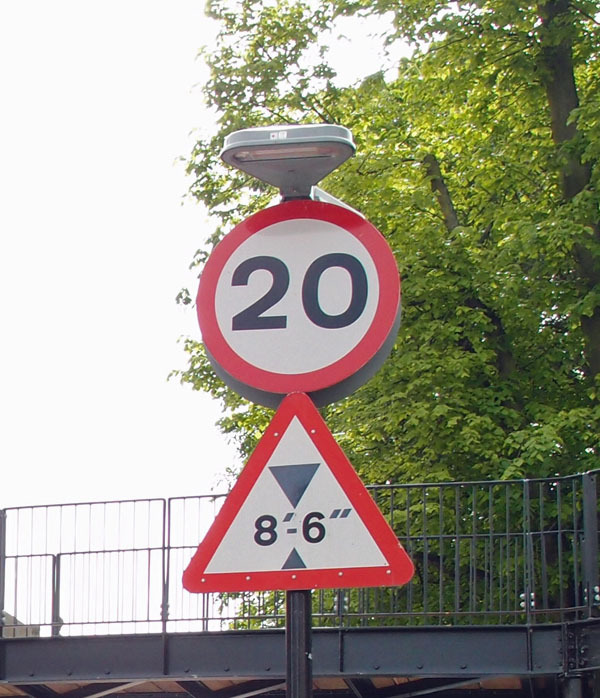 How on earth are you going to get people doing more physical activities if you take away lower road speeds? As if in the streets with 20mph signs we are of course all running about doing aerobics on the verges and if those signs go we’ll all just flop on our sofas and eat chips all day. If you find the signs irritating and dogmatic, or think they have the power to magically transform neighbourhoods into healthy peaceful utopias, or perhaps have an opinion somewhere in between, do feel free to add a comment. This website is completely independent, receives no external funding, costs money to host and a lot of time to write. If you’d like to support this work and help pay the hosting costs you can do so via this link.